Nothing can ruin a bike ride faster than a flat tire. But, knowing how to fix a flat tire is a skill that anyone can learn, and will save you money, time, and frustration. If you carry around a bicycle pump, wrench, a tire patch kit, and tire iron with you when you ride, you will always be prepared to fix that tire. Whether you get a flat out on a muddy trail without phone service, or a few blocks from home, this simple guide to patching your bicycle tube will prepare you for the worst. 1. Remove the wheel. Remove the wheel with the quick release or use the wrench to loosen the nuts that hold it in place. 2. Remove the tube. Place the tire iron between the tire and rim. Push underneath the tire, and move along the entire tire rim. By pushing one complete side of the tire off of the rim it will be easy to take the tube out of the tire. 3. Check for rocks. Pull the tube out from under the tire. Make sure there is nothing in the inside of the tire where the tube was, that could have created the hole. 4. Locate the hole. Either squeeze around the tube until you find the hole, or inflate the tube with your pump and find where the air is leaking. You should be able to hear a hissing noise where air is exiting. 5. Mark the hole. Use your chalk to mark the hole in your tire. 6. Take Out Patch Kit Materials. The patch kit should include sanding paper or a metal rasp, glue, and the patch. 7. Sand. Use the sandpaper to roughen the area where the patch will be placed. 8. Apply the glue. Apply the glue to the tube, wait the designated amount of time given on the patch kit’s directions, and place the patch over the hole, holding in place for a couple minutes. 9. Return the tube. Add some air to your tube to give it some shape. Line up the valve stem with the hole in the rim and push the tube back underneath the tire. Follow along the tire until the entire tube is underneath. Then, move along the tire, pushing it back into the rim. 10. 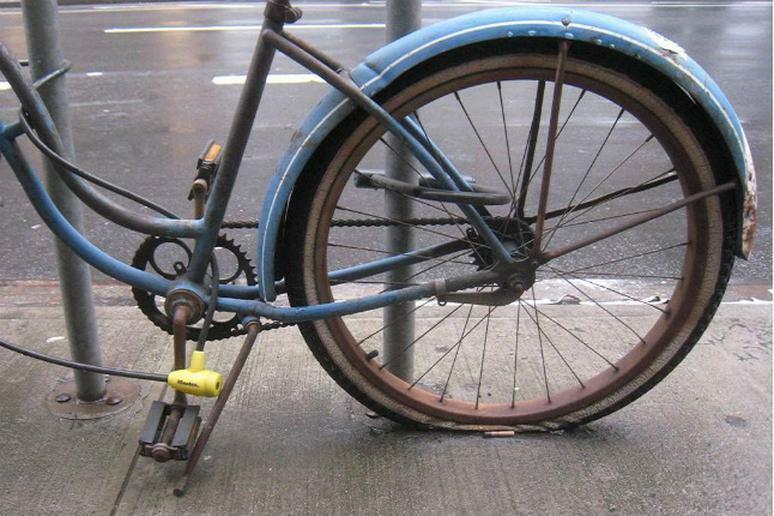 Return your tire to your frame. Make sure the tire is tightly secured. 11. Pump up the tire if necessary.